Take advantage of datacentre facilities, server and storage hardware as well as the latest software solutions that are normally only affordable to the largest of multi-national companies. Avoid the 3-5 year cycle of large capital expenditure required to maintain and refresh on premise IT. Due to the enterprise grade quality of our cloud it is highly resilient and can therefore tolerate a server, storage system or even complete datacentre failure. Reduced PC hardware and licensing costs. More secure as your data is centrally stored in the cloud and user devices can be locked down. Reduced on premise installation and maintenance costs. Anywhere anytime access to your data and applications. Remove yearly renewals such as Internet based backups and email scanning solutions. Our enterprise cloud is built using the latest Dell servers and storage systems across two Tier 3/4 datacentres located within Hertfordshire. The infrastructure runs software from leading vendors such as Microsoft, Citrix and VMware. While public clouds, such as Microsoft Office 365, offer low cost solutions for basic business needs, such as corporate email, they are not able to provide a complete or bespoke dedicated working environment for all of your applications and data. For a complete solution you need our enterprise cloud. All of our cloud solutions are charged on a transparent per user per month basis which is payable in arrears by direct debit. A dedicated private cloud is where resources are provisioned and managed for the sole use of a single organisation. This type of cloud is best suited to larger companies who have more complex needs, lots of 3rd party applications or have specific regulatory/legal requirements. A shared private cloud allows multiple businesses to utilise shared resources such as email and file servers. Due to the way the software is designed and implemented your systems and data are still completely secure and isolated. This type of cloud is best suited to smaller businesses with simpler needs and a lower budget. For larger businesses who require a scalable, flexible and bespoke solution we design and implement dedicated private clouds. Using a private cloud gives the ability to cater for a complex array of 3rd party applications, large data storage needs, different administration models and total isolation. It also means we can make the environment completely bespoke to your requirements and can adapt the solution as your needs change. Smaller companies, who do not have the need or budget for a dedicated private cloud, are able to utilise our shared private cloud. In a shared cloud, services and resources, such as an email server cluster, are securely shared between multiple tenants so that you can utilise the latest technology at a lower cost. Due to the way our cloud has been built, by engineers with enterprise experience and training, your data and applications are always secure and only accessible to your business. 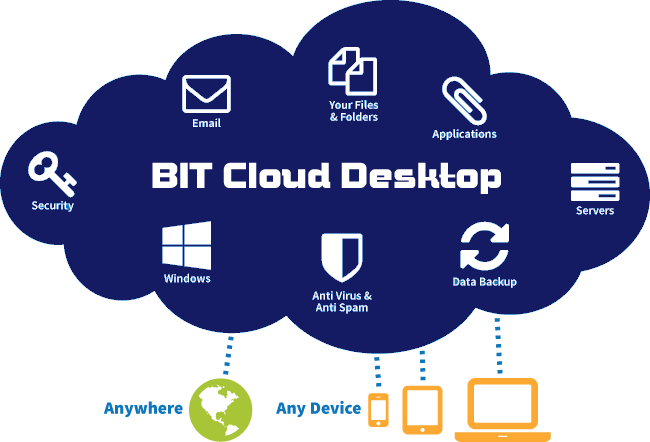 We deliver (provide access to) both dedicated and shared cloud solutions using a Cloud Desktop. Just as your users do now they log into a desktop, via a secure web page, and see a Windows desktop environment. Within the Cloud Desktop they will see all of their applications, network drives, printers and data. Users can access the system from any Internet connected PC, Mac, laptop, tablet or smart phone. User management and authentication servers. Email servers running the latest version of Microsoft Exchange Server (the leading business email platform). Database servers running the latest version of Microsoft SQL Server (the most popular business database engine). File and print servers to host your corporate data and to allow printing back to the printers located in your office(s). Application servers to run your 3rd party applications such as accounting software, sales management, case management, CRM, etc. In a private cloud these servers would be dedicated to your business or, in our shared cloud, the server resources are securely shared between multiple businesses. Once the server infrastructure has been built we create user identities, configure core business services (such as email), install and configure your 3rd party applications and finally migrate your data. Throughout our cloud environment we run the latest (following detailed testing and approval) software from leading vendors including Microsoft, Citrix, VMware and Veeam, to name a few. With the exception of specific requirements for Linux operating systems (which we can accommodate) we currently use Microsoft Windows Server 2012 R2 as the base operating system for our server instances. For email we use Microsoft Exchange Server 2016 and for database applications we use Microsoft SQL Server 2014. We believe in using the latest technology which is why our cloud environment is virtualised throughout, using a best of breed approach, with hypervisors from Microsoft and VMware. In both of our datacentres we use the latest Dell servers, storage arrays, network switches and firewalls. Minimum of N+1 redundancy across all major components. Dual 32-amp power supply to each cabinet. Battery UPS to ensure a constant supply of clean, filtered power. Back-up generators with emergency re-fuelling contracts in place and fuel stored on-site for 72 hours of operation at full load. Dual (N+1) VESDA fire detection & FM200 suppression system. 24×7 Network Operations Centre (NOC) monitors the data centres. Ultra-low-latency network provides optimum performance. The environment is tightly controlled, with the room temperature fixed at 23°C +/- 1°C. The cooling units have HEPA filters to eliminate contamination. Reinforced flooring can accommodate up to 1,200kgs per cabinet. Multiple diverse fibre links into the data centre located at different entry points. The Stevenage datacentre has physical fibre from BT and Virgin. The Welwyn Garden City datacentre has physical fibre from BT, Virgin, Level3 and Zayo. State-of-the-art energy efficient cooling technology, with a target PUE of 1.2 at full load. Up to 40% more energy efficient than more traditional data centres by using latest aisle-enclosure cooling technology and free air cooling in colder periods. 24×7 on-site staff provides additional protection against unauthorised entry. Unmarked facilities help maintain low profile. Full Redcare GSM alarm system linked to local police control centres. Redundant on-site and off-site monitoring systems in place. Mobile security monitors the sites alongside our own security staff. Throughout our enterprise cloud design, resilience and business continuity have been key design goals. We run clustered servers throughout the infrastructure, as well as application level protection mechanisms, to ensure a server failure, database corruption or other software issue does not impact on the operation of your IT. The physical design of servers and networking equipment is also meshed (N+1) to ensure there is no single point of failure. Unlike some cloud providers we don’t do shortcuts or low cost options which could put your business at risk. As such we don’t pick certain servers or elements to protect with full disaster recovery. Instead we replicate our complete infrastructure from one datacentre to another so that in the event of a datacentre failure we are able to bring all systems back online in the secondary location. As part of our cloud service we will work with yourselves to create backup routines and schedules to meet your needs. These will ensure all of your critical data is backed up and retained as necessary.